How Do I Choose the Best Mountain Bike for Me? What Kind of Riding Will I Be Doing? The first question to ask yourself is, “What kind of riding will I be doing?” Different riding styles require different bike styles, so your first consideration is where and how you plan to ride. After that, you want to decide what kind of suspension system you need. Lastly, but certainly not least, you must make sure your bike fits you well. This is best done in person, of course. If you’re looking for a road bike, read our post about how to pick the right road bike. Trail bikes are the most versatile kind of mountain bike—the Swiss Army knife of mountain bikes, many have said—and allow you to tackle a variety of trails and riding conditions. With these bikes, the emphasis is on fun and efficiency. If you want to ride beginner- to intermediate-level trails alone or with friends, with a mixture of climbs and descents, this is the kind of bike you want. Cross-country bikes are uphill, lung-busting machines that tend to focus on efficiency and low weight. These bikes can be great if you’re considering getting competitive or would like a racier ride for your local trails. If fast climbing and the buzz for endorphins is your thing, and you’re a more conservative rider on the downhill, you’re looking for a cross-country bike. The defining feature of fat bikes is their oversize tires, which range in width from 3.6 inches to 5.0+ inches. These extra-wide tires give them excellent traction, especially in sand or snow. Fat bikes are great for beginners because the wide tires are reassuringly forgiving and require less finesse as a rider picks a line through rough terrain. And even many skilled riders who can only afford to own and maintain one bike are choosing to ride a fat bike year-round, in all conditions. They are also great for riding groomed snow trails in the dead of winter. If you live in an area where the ground stays covered in snow for long periods of time, a fat bike may well be the perfect choice for your first mountain bike. Think of all-mountain riding as trail riding on steroids, with bigger, leg-burning climbs, longer, scarier descents, and more technical features. Bikes for all-mountain riding are designed to perform well on steep descents while also being light and nimble enough to pedal uphill. 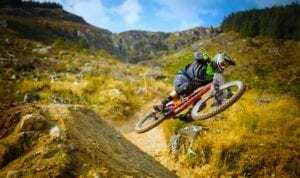 The combination of incredible descending abilities and surprising climbing efficiency have made all-mountain bikes very popular with riders who seek out the most challenging trails around. The most aggressive bikes in this category approach the technical chops of a true chairlift-only downhill bike, making them the best choice for riders who spend a significant amount of time riding lift-accessed bike parks, yet still want to ride trails that are pedaling access-only. Mostly ridden at lift-serviced bike parks, downhill bikes are big and tough, and riders wear full-face helmets and body armor as they encounter jumps, berms, rock gardens and wooden ladders. Downhill bikes are designed for steep, gnarly terrain, speed, big drops, and jumps. 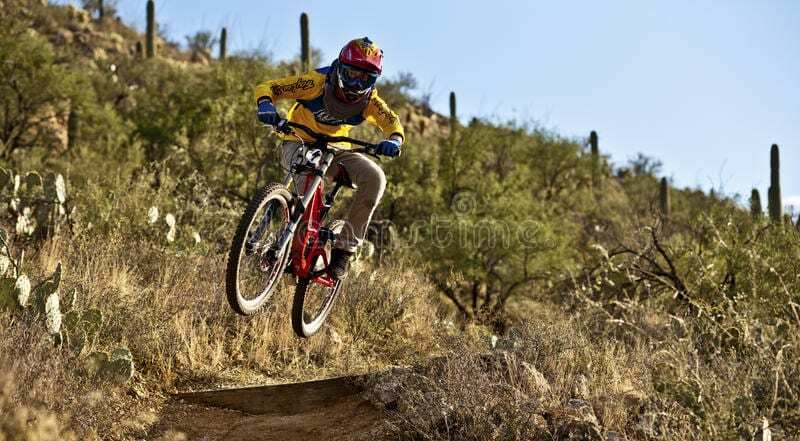 If you’re not even remotely interested in pedaling uphill, have the trails and terrain to support high speeds and airtime, and the skill level to handle yourself in these situations, a downhill bike is what you’re looking for. Suspension is one factor that can vary between the different types of bikes, so here’s a little primer for you. You’ll find that it’s mostly fat bikes that have rigid suspension. Most riders find that the wide tires and low tire pressure provide all the squish needed to absorb bumps on the trail; no suspension system is needed. These bikes have a suspension fork in the front to help absorb impact on the front wheel, but the rear of the bike has no suspension—thus, a “hardtail.” Hardtails are typically less expensive than full-suspension bikes and have fewer moving parts (which often translates into less maintenance)—they are a solid option for everything except serious lift-serviced downhill trails. Cross-country riders, especially, gravitate toward hardtails as these bikes allow more direct transfer of power between the pedal stroke and the rear tire. There are many variations of full-suspension bikes, but the general idea is for the front fork and rear shock to absorb the impacts of the trail. This drastically reduces the impact on the rider, increases traction, and makes for a more forgiving and enjoyable ride. However, on more difficult trails, there can be some “bob” that soaks up some of the energy transfer from the pedals to the wheels. To compensate for this, many full-suspension bikes have the ability to “lock out” the rear suspension. Buying a bike that fits well is the most important part of the process. A bad fit can transform a dream bike into a torture device, where as a bike that fits well and is right for your height, flexibility and riding style is a bike you’ll love riding. A properly fitting bike can help you improve your handling and build confidence on the trail, allowing you to feel more comfortable tackling more technical and challenging rides. Mountain bikes come in standard sizes (S, M, L) that are similar across brands. If you’re in-between sizes, it’s best to err on the smaller side as more sizing accommodations can be made with a smaller frame than with one that’s too large. But really, the best advice we can give you is to go to a bike shop to have a professional fitting done. Another great tip is to take the bikes that interest you for a test ride. With the help of a sales specialist, you should be able to narrow down your selection to two or three bikes. See if you can get them for a weekend, or at least take them for as long as you can over the terrain that you intend to be riding (sometimes these are paid demos, other times not). Also check with the local shop for “demo days,” where the vendors will set up at a local trail with different mountain bike models to test. In most cases, one bike is just going to feel better for you than the others–that’s the one you want. 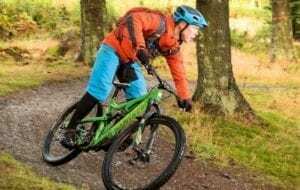 This is even more important than for a road bike, given the more rugged and potentially dangerous terrain you’ll be traversing with your mountain bike: when considering any used mountain bike, even from a friend, look the bike over very carefully. Even better, if possible, try to have a local shop look over a used bike for you. The important thing is to avoid spending your bike budget on a bike, only to discover that it needs a several hundred-dollar repair. The last step before you walk out the door is to stock up on all the accessories necessary for an enjoyable ride. Rider Accessories: helmet, gloves, water bottle (see our reviews of the best water bottles). Bicycle Accessories: tire repair kit, cassettes, spare tube, tire levers, pump, bike multi-tool, chain lube, and bike racks to carry your bicycles.